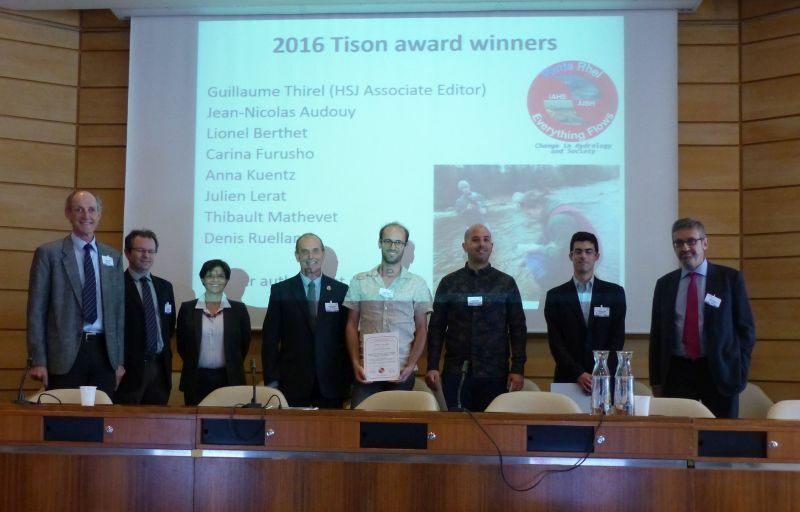 The 2016 Tison Award was presented to Guillaume Thirel, Jean-Nicolas Audouy, Lionel Berthet, Carina Furusho, Anna Kuentz, Julien Lerat, Thibault Mathevet, & Denis Ruelland. Left to Right: Hubert Savenije (President, IAHS), Christophe Cudennec (Secretary General, IAHS), Blanca Jiménez-Cisneros (UNESCO), Mike Acreman (Co-editor HSJ), Guillaume Thirel (Irstea, Tison Award Recipient), Thibault Mathevet (EDF-DTG, Tison Award Recipient), Lionel Berthet (DREAL Centre-Val de Loire, Tison Award Recipient), Tommaso Abrate (WMO). The IAHS Tison Award, established in 1982, aims to promote excellence in research by young hydrologists. The Award is granted for an outstanding paper published by IAHS in a period of two years previous to the deadline for nominations.